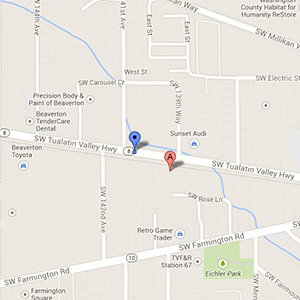 Our Mac’s Automotive & Radiator Repair in Beaverton, OR is located right on SW Tualatin Valley Highway. Our family business is currently operating in its third generation, and we are proud to be recognized nationally as a leader in the manufacturing of products and services for cooling systems for vintage and performance vehicles. We do more than just radiators and cooling systems! We are proud to say that we also specialize in all forms of auto repair vehicle maintenance, and preventative services. Are you in need of Auto Repair? Has your car been making weird noises? Have you noticed odd driving sensations? It may be time to bring your car to us for service! At Mac’s in Beaverton, OR we provide expert routine preventative maintenance, as well as factory scheduled maintenance, to prevent car troubles from ever occurring. However, if you do find yourself in a situation where something is wrong with your car, you can be sure that our expert technicians know how to repair your vehicle. Simply call to make an appointment or stop by to have us take a look. You can feel confident that our team will repair your car right the first time and our 2 year/24,000 mile warranties backs it up! For over six decades, our team at Mac’s Radiator has been dedicated to meeting and exceeding the needs of our customers in Beaverton. We have many loyal customers who come us for all of their radiator repair services, including work on foreign, domestic, vintage, and heavy-duty vehicles. For more information, give us a call today at (503) 716-4974. We look forward to seeing you!